Sometimes you just want something warm, chewy, chunky, hearty and delicious. Things like stew, chili, escarole and sausage… etcetera. I know with the winter we’ve been having, I’ve been craving dishes like that almost every single day! But, let’s face it, we can’t eat sausage, bacon, or ground beef every single day… as much as we’d like to. With this in mind, I recently took my love of escarole, white beans & sausage as inspiration and morphed it into a healthier, but no less satisfying, soup. 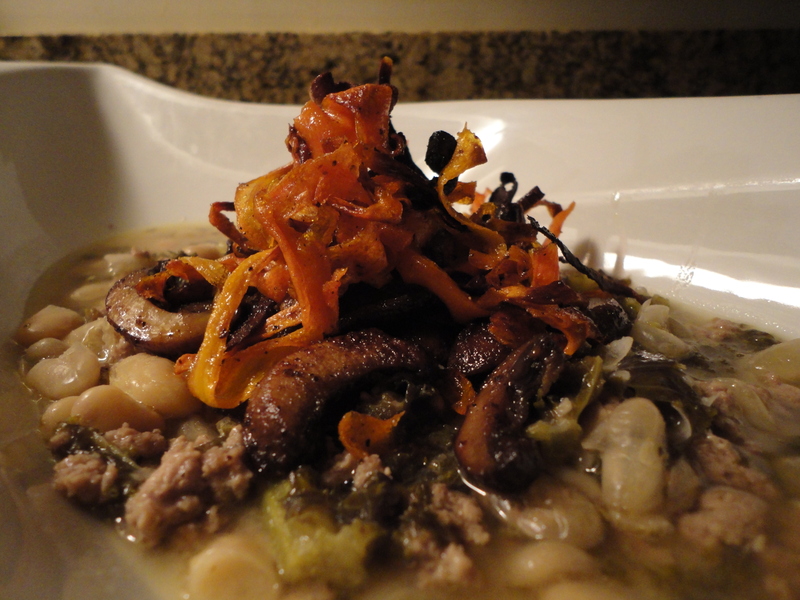 So here you have my recipe for a Turkey, White Bean & Kale Soup with Roasted Mushrooms & Carrots. *One quick note… If you’d like to make this dish even healthier you can omit the 2tbsp of butter from the soup altogether, and replace the butter from the mushrooms with 2tbsp of olive oil. The butter just makes a richer, more flavorful dish. In a large sauce pot (I use an 8qt) heat the olive oil at medium, add the chopped garlic, onion, and 1/2tsp of salt and saute for 3 minutes, stirring periodically. Increase the heat to high, add the turkey, as well as 1/2tsp of salt and 1tsp of black pepper, and cook until lightly browned, stirring periodically. Add the chopped kale and 1/2tsp each of salt and pepper, cook until the kale is lightly wilted, stirring periodically. Add the wine and simmer on high until reduced by half. Add the chicken stock, water and bay leaves, bring to a boil then reduce heat to medium-high and simmer uncovered for 30 minutes, stirring periodically. Reduce the heat to medium, remove the bay leaves, and add the cannellini beans, simmer uncovered for 45 minutes, stirring periodically. With 5 minutes left add the 2tbsp of unsalted butter and season to taste, if needed (I didn’t, but everyone’s taste is different). While the soup is simmering you can work on the mushrooms and carrots. Clean and peel the carrots, then using either a mandolin or peeler ribbon the carrots lengthwise, as thinly as you can. Put the ribbons in a large bowl, then toss with the olive oil and seasoning until evenly coated. Spread the ribbons out on a baking sheet and bake until moderately browned, stirring around periodically to promote even roasting, approximately 25-30 minutes. In a large saute pan melt 3tbsp of unsalted butter at medium-high heat. Add the sliced mushrooms and seasoning and saute until browned, stirring regularly, approximately 15 minutes. Set the cooked carrot ribbons and roasted mushrooms aside at room temperature until needed. Once the soup has finished simmering go ahead and plate it up (or should I say bowl it up?) then top it with the roasted mushrooms and a nest of carrot ribbons. So let’s talk wine pairings. I would strongly recommend sticking with red wine here, preferably something medium to full bodied and on the rustic side. Think Rhone Valley, Languedoc, Piemonte, Valle D’Aosta, Rioja, Chinon from the Loire… you get the picture. If you absolutely have to go white, then it better be full bodied and able to hold its own! California Chardonnay, skin-fermented Pinot Gris or Vermentino, dry Trebbiano, oak aged Malvasia or Rioja Blanco… something along those lines. You can’t walk into this party with a light crisp Pinot Grigio! Here are a few wines that I would recommend. There you have it, my hearty, delicious, stomach & soul warming and moderately healthy (even more so if you take out the butter… lol) soup recipe. I hope you’ve enjoyed the read, and I certainly hope you’ll make the recipe and try some of my wine recommendations. As always, new content is coming soon. In the meantime crack open a rustic old world red, sit back, and relax. Life is short, enjoy it! Tags: beans, cooking, easy recipes, food, gluten free, homemade, kale, perfect pairings, perfect pairings at home, recipes, roasted, soup, turkey. Bookmark the permalink.